Time to talk spinners. And no, I ain't talkin bout dubs here yo. With the really cold weather hitting this week in Eastern PA, think I'm going to start making some more inline spinners with my trusty Boggs Tacklemaker. That thing has been great so far. (You can click HERE to see one of my previous posts on this little widget). Will probably make more of my "Michelin Man" spinners, as they worked well for me this past season on both trout and bass. 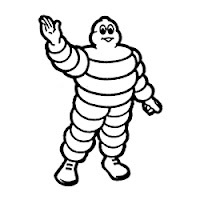 So in the spirit of giving, here is the "recipe" for the Michelin Man. Insert the hook in the open loop, re-insert into the BTM, and close the loop. Voila! You're done. Bask in your new found glory. Actually, that's a pretty crappy description on actually how to assemble, especially if you've never seen how a Boggs Tacklemaker works. So to compensate, here's a video lifted from the Boggs' site that shows the twisting in action. It also features a great "Cosby Show" soundtrack circa 1986. Hope this helps!